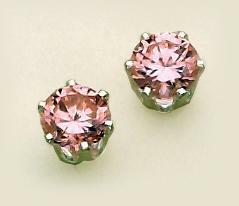 Round Pink CZ (cubic zirconium )silver Post Earrings. A large 3 ct. CZ each (6 ct. weight). A great match to our RA13JL and RA81 pink CZ ring. Optional necklace is available, at $4.95 please specify when ordering. See EA110PKS for a solid Sterling Silver gift boxed version.